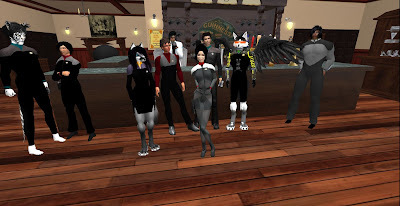 Debbydo for GFC news: Gibraltar RP "Missing, Gone, Not Here"
Gibraltar RP "Missing, Gone, Not Here"
The Gibraltar RP goes on an adventure to find their missing crew members Snapper Desade and Debbydo, apparently all leads led them to a pub....I can imagine the logs now. Robobby's Official log "We've scanned the length and breath of the quadrant and only found traces of them in a bar somewhere, until the scanner battery ran out, we must investigate to get our crewmen back". Robobby's Unofficial log "Damn it Jim, they're skiving off again, anyone for a drink, I hear there's a new pub in town, does the sweeties pint of guinness this side of the third nebular". Was this the Last seen images of them???? IM RoBobby McMillan for details.